Well, I intended to have this update posted by Memorial Day, certainly before the end of the month. I actually had Memorial Day off, as did many Americans. However, that Sunday afternoon a supervisor called me and advised me that the truck schedule had been changed. The truck was in fact coming in on Monday, so I had to be there. Obviously this necessitated the shuffling of priorities, and some things were de-prioritized, this update in particular. This update has fewer photos than usual, because I had to leave the meeting early to attend a friend’s graduation. So, with no further ado, let’s get to the photos! We start off this update with a shout-out to Doug, who RAOK’d me with yet another McTimeMachine! With my own original, and the one I got from Big Tractor Mike back in March, that’s three of just this variation alone. 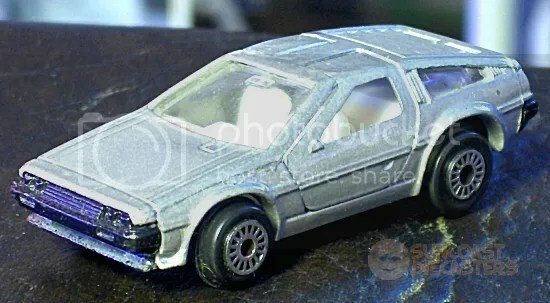 My DeLorean collection is growing by leaps and bounds! Here we have the Midas Monkey, the Hot Wheels toy based on the car designed by Gas Monkey Garage for Mattel to make into a Hot Wheels toy. (Feel free to diagram that sentence and get back to me on it.) This specific one features some customizations by a guest from the old Hot Nutz Club (the precursor to Suncoast Diecasters), not the least of which are the redline Real Riders in place of the stock FTEs. And right now you’re thinking, “But – but it’s still inside the blister!”. Yes; yes, it is. Back to Doug again. He brought in this hand-crafted hay hauler so’s BTM could fit it with some replacement chains. Did I say hand-crafted? Yes, indeed. The undercarriage is 3D-printed, and the chains are of course metal. But the floor and cage structure are all cut, painted, stained and assembled by Doug. Young man with a hobby. This is a Ferrari 512 M, by Solido, at 1/43-scale, from Bob’s collection. The spoiler on this model is adjustable. This is a Porsche Carrera 10. 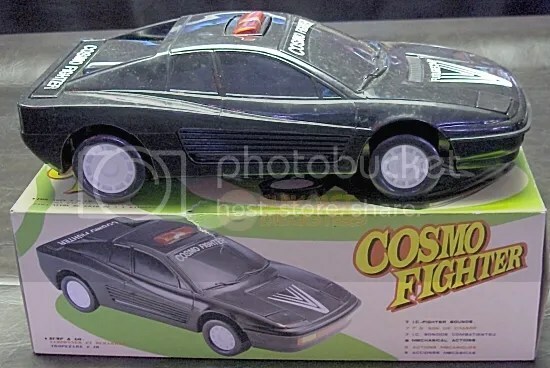 This is actually a pre-Mattel model. It bears the Mebetoys name and logo on the base. …And here we have the piece of resistance, a model that’s actually branded as Mattel. In fact, this one is branded like some people get tattoos: Mattel, Mebetoys, Sputafuoco, Hot Wheels and Heisse Räder. That’s, like, *all* the markets. This is the Chevrolet Astro II. And no, it’s not just a Mebetoys fantasy model. It’s based on the actual Chevy concept vehicle. Yes, its spare and cover are missing. This does *not* subtract from the model’s cool factor. Oddly enough, considering the few photos in this update, I had a bit of time choosing among them for our FotM. In the end (or, at the end, which is where we are), I decided on the Astro II. Older Hot Wheels models are by definition rare. 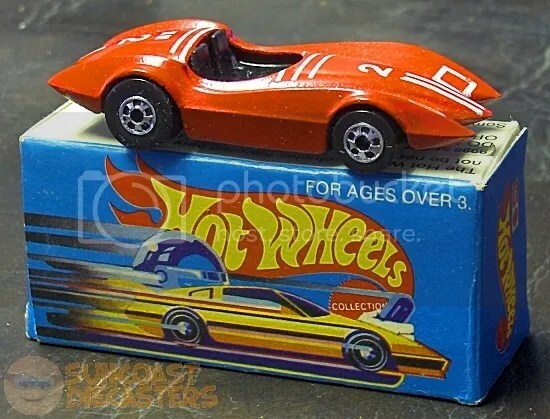 To have a model which is from a native 1/43-scale import line, with frankly a somewhat misunderstood history, and yet is nonetheless legitimately branded as a Mattel / Hot Wheels product, is to have a model that is truly among the rarest of the rare. Congratulations, Bob! ; your Gran Toros Chevy Astro II is Suncoast Diecasters‘ Find of the Month(*) for May of 2017! February went quite well for Suncoast Diecasters. Lots of great buys and trades at our meeting; and even K-Day was better than usual. For myself, I came away with three nice new rides. 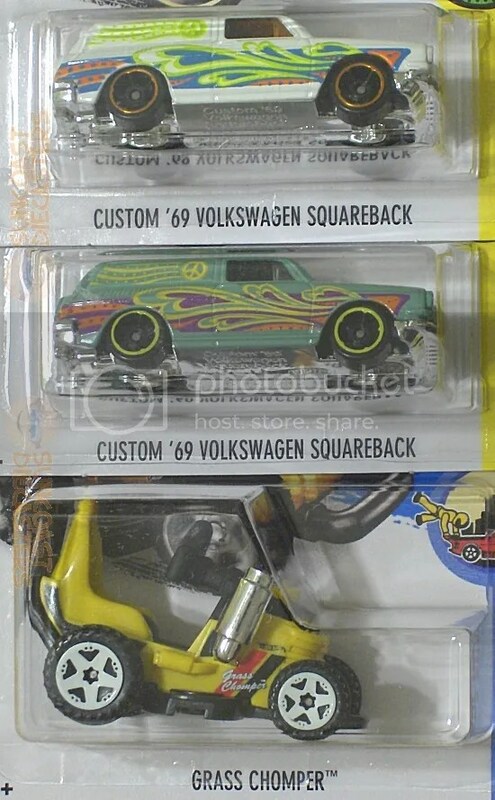 I first picked an “exclusive colors” variant of the Custom ’69 Volkswagen Squareback out of my box. I was kind of iffy on it, when I found a regular, teal(? )-colored one as well. I think they make a nice set, so I kept ’em. Also got the Grass Chomper custom lawn mower. You can tell by the “tumbling guy” logo on the card that it’s part of the “figures” subset, designed to carry Mega Blocks figurines. Most of those vehicles aer IMHO too toy-like, with all the pegs. The Chomper, however, has few such pegs, and they’re well-disguised. And it has a neat (if unintentional) 1/43 look to it. Now, on to the photos! Boy, oh boy. All I can figure is that Big Tractor Mike just hates Star Trek. Every time I bring in Star Trek stuff, he makes it all go away! In fact, this month he even made non–Star Trek stuff disappear! Does his wrath know no bounds? 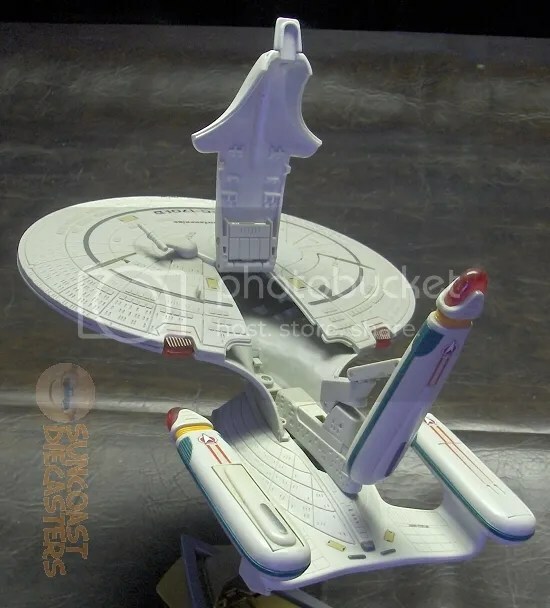 Well anyway, he starts off with this Enterprise-E (NCC-1701-E) which first appeared in Star Trek: First Contact. 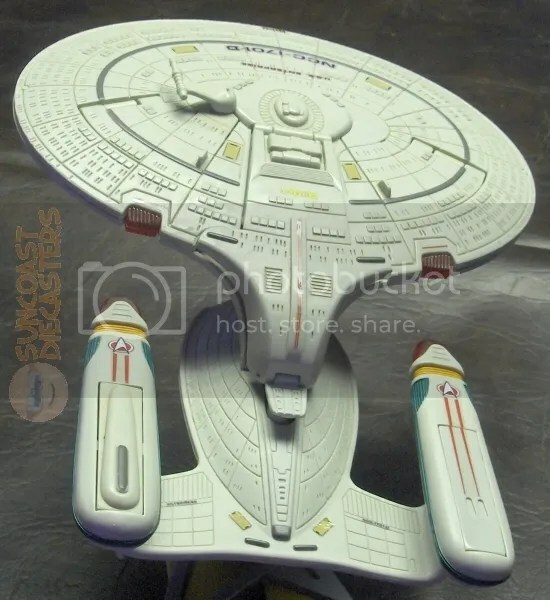 What I’ve always appreciated about the various redesigns of the Enterprise — which I admit is an obvious notion — is how the modellers maintain the established saucer/hull/twin nacelles configuration while making each iteration more streamlined and futuristical. Features working lights and sound. The toy, some 15” long, looks sadly puny on its oversized stand. 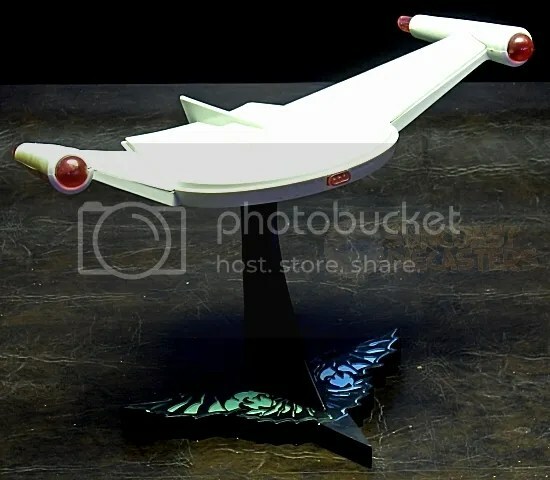 Here, we go back to the future with the old-school, “Original Series” Romulan Bird-of-Prey. 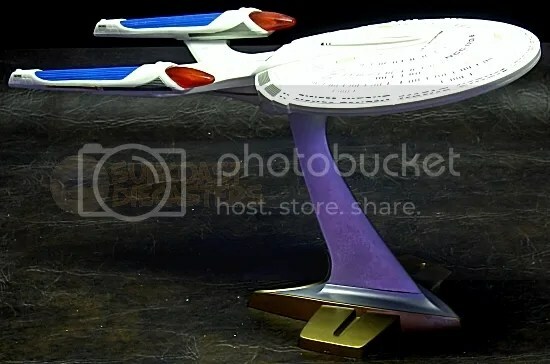 I haven’t been able to verify this, but I’ve often thought that designer Wah Ming Chang created the BoP at least partially as an homge to the classic “flying saucer” designs of 1950s sci-fi. 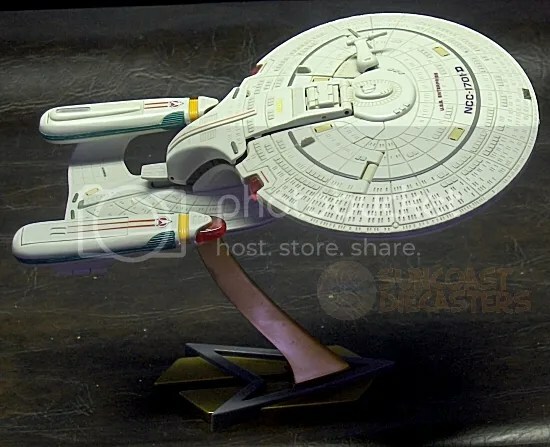 I apologize for not even considering a photo of the toy’s ventral hull which features a great depiction of the “bird of prey” graphic. Features working lights and sound. Yep, overexposed and washed out. My bad. And finally we have the Enterprise-D … and then some. This is the “alternate future” D from the episode All Good Things… — except when it’s not. Despite the presence of translucent plastic details, this toy does not feature light and sound. Instead, what it does feature is the ability to transform from the “regular” D configuration to the “alt-future” version (and back). 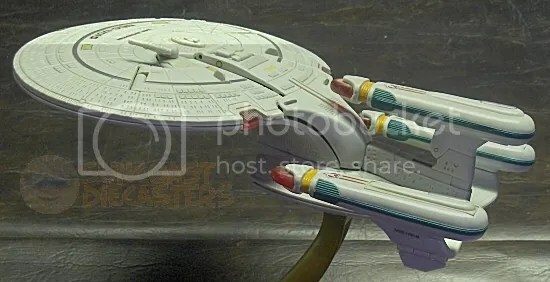 Note in the photo differences between the nacelle surfaces, as well as an enhanced phaser cannon to the left of the bridge. (It also features the massive “Borg Buster” cannon on the saucer’s ventral surface which, again, I neglected to photograph). I arranged it in this half-transformed configuration specifically to highlight the differences. You remember that Star Trek/Transformers crossover, right? How do we make it look more futuristic? By adding parts! R2, that stabilizer’s broken loose again. See if you can lock it down. …Then finally aligning those parts and snapping them gently together. BOOM! Mutant third warp nacelle! Mike also acquired this Scotty figure which features a really neat gimmick. You’ll note (despite the glare) that the figure’s lower arms and entire lower half are transparent, with glitter flecks embedded. The figure is on a stand molded to look like a transporter pad. A button on the pad activates a digital recording of the “Original Series” transporter sound effect while also ramping up a super-bright LED to full brightness, which then fades out again. 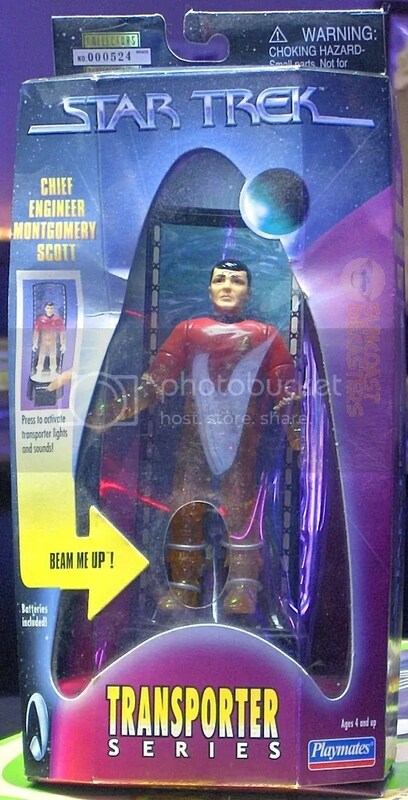 The light dances up through the figure’s transparent parts, giving the illusion that Scotty is beaming out. Oh, the wonders that show up on QVC. (Or Home Shopping Network, whichever.) Seriously, I bought this from a TV shopping show back in the ’90s. It’s a bump-n-go toy, but what really intrigued me was its secondary action. After a few moments, it would stop, then a pad would extend from the base, lifting the car off the floor. The rear panel labeled “Cosmo Fighter” would raise up to reveal lighted “thrusters”; its wheels would raise in a “hover mode” fashion; and short, Chitty-esque winglets would extend from its sides. Then it would reset and drive around again, repeating this cycle. 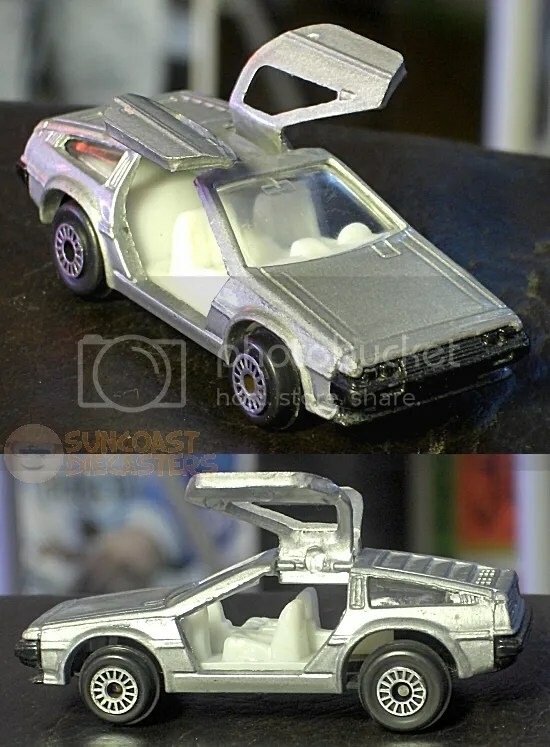 The overall effect was a sort of combination of the Back to the Future DMC-12 and the Spinner from Blade Runner. …And a name right out of ’60s sci-fi! Sadly, as is typical of bump-n-go’ers over time, its b-n-g drive no longer works. However, the secondary action still does, and it makes for a neat show. It’s also very large; the car’s a good foot long or so, so it’s also a great rolling toy. BTM got this in the Great Trek Removal as well. I don’t have video or a photo of its “alt-mode” because we would’ve been thrown out of the Sports Bar. Because it’s REALLY REALLY REALLY REALLY loud! Finally, Mike got this Happy Meal(?) 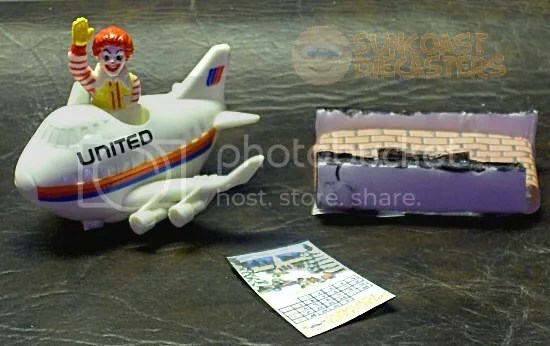 toy, which includes a side of gimmick: pressing down on Ron McD winds a spring action, which sends the plane zipping across the floor when you let go. He also got the sculpted foam fireplace (which I should’ve posed better) and calendar from our Santa’s Cycle Shop Christmas panel. Yes, indeed, Big Tractor Mike acquired two pieces of Suncoast Diecasters original artwork. Very uptown of you, Mike! When I suggested a certain price for the whole lot, I could tell from the look on Big Tractor Mike’s face that he was undulating, calculating and formulating a counter-offer. He later approached me with a car-n-cash offer. The car offered as the “car” in the “car-n-cash” offer is this … which at first I didn’t recognize, because its proportions are off. It is in fact a DMC-12. Not sure if its roofline is too high, or if its body is too narrow. In either case, its windshield is too square as a result; it should be clearly rectangular. Hey, Mattel! Notice anything? Gettin’ any ideas? Tom, ever vigilant for VWs, picked up this Hot Wheels pack which features two beetle variations and two van variations. There. Now you are enjoyed. 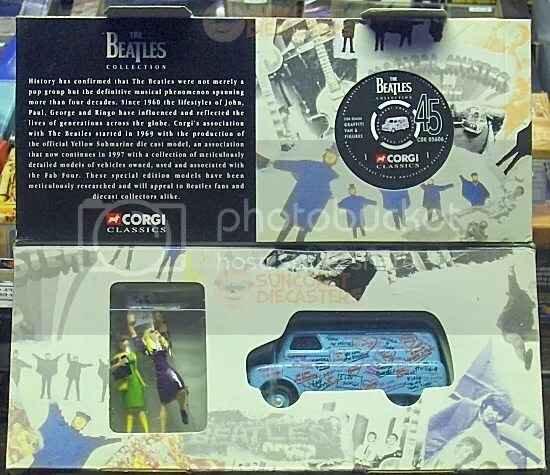 Tom also went a bit loose with the definition of “beetle” by bagging this groovy Corgi retro-commemorative. The box top (face?) 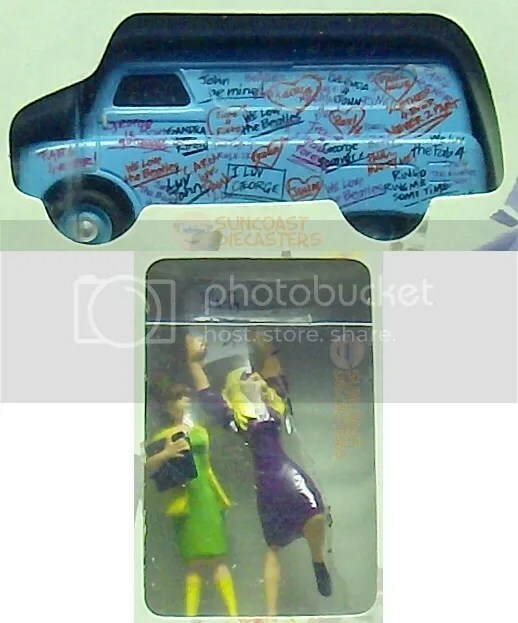 flips up to reveal a nicely-displayed van, er, lorry, as well as a sculpt of the two groovy groupies. …And with a van like that, you know Tom should be glad. 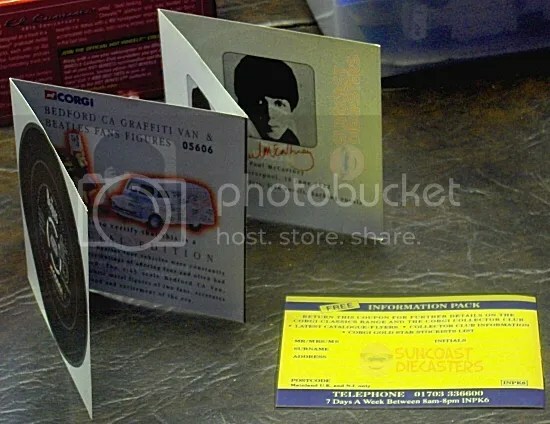 The “45” in the corner reveals itself as an informative fold-out, with a mail-in card for further info on the Corgi Classics series tucked inside. Being for the benefit of Mr. Tom. Now, you didn’t really think I’d leave without showing you a sweet close-up of the van, did you? (I’m not leaving, that’s just how the cliché flows.) Here ya go, along with a nice shot of the gals. Or ”birds”, as they’re called in the land of the Mersey Beat. Bill bagged this awesome 20th Anniversary set. These sets each feature a special variant Anniversary model, such as the Monster Vette here. Available in either gold or chrome, these models also have a custom 20th Anniversary logo stamped into the body shell. Price on the Toys ‘R’ Us sticker? : $1.99 (in 1988 dollars). Ironically, this set is now 28 years older than the anniversary it’s celebrating. 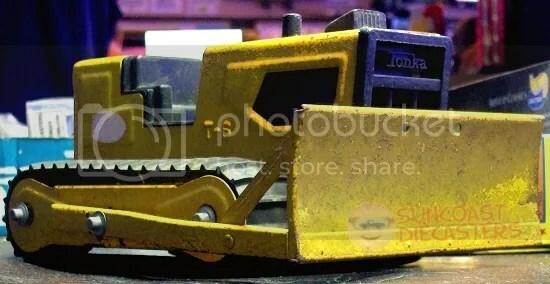 Doug bought this massive Tonka bulldozer from BTM. This is from the days when toys were really meant to be played with. You’d go out to your sandbox (or, anywhere in the yard, really) and do some serious digging. At least until your mom caught you. Lovin’ that well-worn, much-played-with pitted surface on the blade. Don’t know if this is designed to a particular scale, but it’s huge. I’d peg it at about ”1/2-toaster oven”. Recall that Doug brought in a Sizzlers set, then more recently brought in an Anki Overdrive set. Well, for February Doug has gone full-circle– er, more accurately, he has gone full-trioval with the slot car set he brought in. A video is thoughtfully provided below for your viewing pleasure. Ken cornered this quaint, kaleidoscopic quintet of colorful Colectomatics to corral into his cultured (if cumbersome) collection, capering and cavorting continuously. That, children, is an example of alliteration. 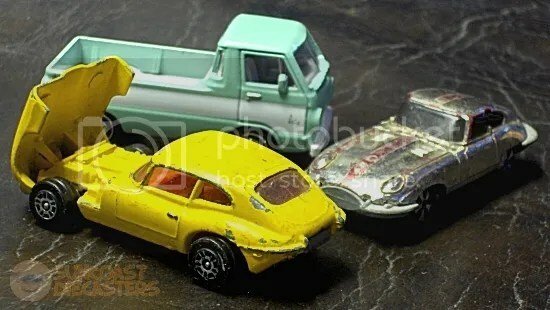 More directly: Here Ken has a 1966 Dodge A100 pickup (Matchbox), a Jaguar E-Type 2+2 (yellow, Corgi), and a Jaguar E-Type (chrome, Faller). Who, or what, is Faller, you ask? Faller is a German toy company which made a variety of toy lines over the years, including diecast miniatures and slot cars. Now the company focuses mainly on train sets and accessories. I’m just concerned about their possible ties to the German mafia. Because it says ”hit car”. That’s the joke. From the Toy Safety Council of Hingna, India. Sharp-eyed readers (and anyone who can read) will spot the name Leo by the Mattel logo. This is a very rare variation, by Leo of India. There’s really no info regarding Leo online. 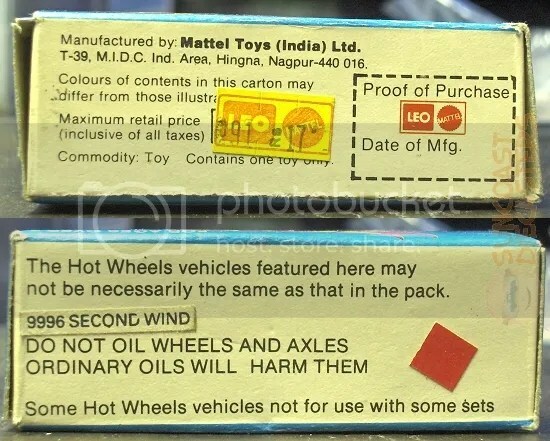 Whereas most other foreign-made HW models simply say “Made in [country name]”, I can only presume that Mattel’s contract with Leo required (or at least allowed) the co-branding. This one is even more rare, in still having its original box. A toy car in a matchbook-sized box? Ridiculous! Mike bought this from Ed, which was dang smart of him. For its unique foreign (dare I say exotic?) 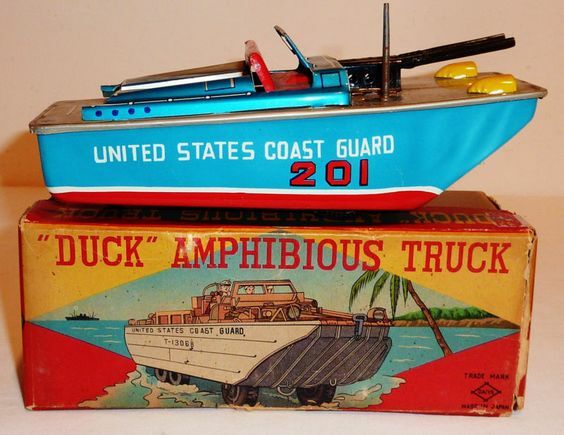 pedigree and richly-colored packaging which itself makes a nice display, I very happily declare this Leo Second Wind to be Suncoast Diecasters‘ Find of the Month(*) for February 2016. That is one classy-lookin’ photo, if I do caption so myself. 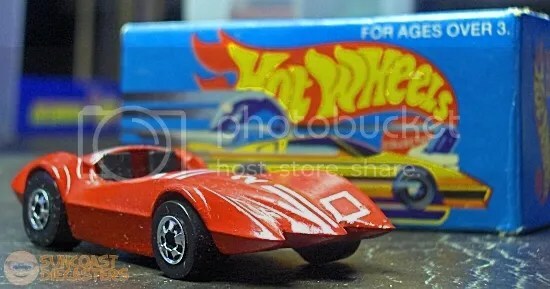 You know that McDonald’s and Mattel/Hot Wheels have a relationship that goes back decades. Once again, Hot Wheels are available in McD’s Happy Meals. There are six models available. They’re plastic, not diecast metal. However, there’s a cute gimmick this year: pull-back motors. The link below takes you to the HapMeal toy page; if you click on a car image, you get a pop-up video showing a child’s hand operating that car. Hard to judge from the videos whether the models are in scale with mainline models. Personally, I’m 50/50 on Twin Mill, and about 25/75 on Bone Shaker; the others I’m skipping entirely. Oh, apparently each model has a QR code on the bottom, which you can scan with your smartypants phone to unlock a game.